You are at:Home»The Catholic Family»Dating & Singles»Would You Date You? Would the type of person you are praying to meet and fall in love with find you attractive? When and if it should happen that you meet someone special, fall in love, and get married, the process starts with you. This is the premise of my first book, Would You Date You? I appeared on “The Catholic Guy” show last week to talk about my new book. Lino Rulli and Fr. Rob were in rare form as they attempted to figure out just what the title was supposed to mean. We must have spent fifteen minutes talking about the foreword. Why, you ask? Well, Lino wrote the foreword, and he is very proud of it. Finally, I shouted, “Hey, enough with the foreword! What about the book?” He shouted back at me, then Fr. Rob had to break it up. In the end, Lino asked me to sign his copy on the air, which I did. It read “To my friend, Lino. No, I would not date you, if I were you. Anthony.” Seriously, it was a great show. However, I was thinking to myself, I bet I could have interviewed myself better than Lino did. 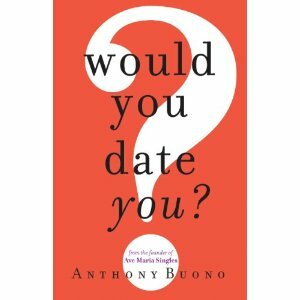 Then I thought to myself, “Why not?” So the following is an interview with Anthony Buono, interviewed by Anthony Buono, about his new book, Would You Date You? Anthony, congratulations on your new book. Why did you decide to write it? Thank you. I was actually approached by Franciscan Media last July to write a book. “What kind of book?” I asked. They approved the outline and we agreed on a finished manuscript by the end of January of this year. One distraction after another, and it was January. No finished chapters. So I commit completely to working on the book, and by mid-February, they had a finished manuscript. I felt like I was back in college when I wrote term papers the week before they were due at the end of the semester. What is the most surprising advice in your book? I don’t want to give it away, but I’ll give you a hint. Knowing if the person has this quality is more important than if the person is Catholic or not (and there are those who say they’re Catholic who don’t have this quality). That’s not very fair of me, is it? A piece of advice in the book that might also be very surprising is why it’s good to be cautious and protective when it comes to kissing, because kissing is the gateway to all sexual promiscuity. I think once you understand that, you have some real power to go into your dating relationships and make a real difference in the chastity department. What’s the best piece of advice in this book? That you would not, in fact, date you, because there is not another you out there. Just kidding! I don’t say that in the book. Well, not exactly. I do believe it is futile to get too caught up in trying to find someone like yourself. The mystery of love doesn’t work that way. Those who try to find someone like themselves usually end up attracted to someone very different. It’s better preparation for the dating process (and for love) to discover and know who you are. Being comfortable with yourself and having a working knowledge of what needs improvement makes you much more attractive to the person you want to meet, and allows you to bring a real person to the relationship. Humility about your true self as a whole helps you become willing to accept an imperfect person you’ll actually date, not the perfect person you’ll never meet. Anyway, people get caught up in what they want and don’t develop as an individual. So really, the best advice in this book is the overall message: work on knowing yourself. Do you think this book will help people take action for the sake of their vocation to marriage? Goodness, I hope so. If they do nothing else, I hope they will at least try out putting the last chapter into practice. The questions to consider while kneeling before the crucifix are focused on examining the conscience of people who want to be married. I wanted the book to inspire people to take accountability for their own life, have the humility to admit their own faults, and have the courage to do something about it, but not take themselves too seriously, or become easily discouraged. The book is about becoming, and we are all always in the process of becoming. Even in marriage, that process continues, so we don’t wait to marry someone who has arrived, but someone who is suitable to share the journey with you. What is the worst thing about this book? Having to suffer through interviews (no offense to you, Anthony). Actually, to be serious, the worst thing about this book is that it was written too fast (that’s what I get for procrastinating). As I read it, I’m like “Oh goodness, I wish I wrote this instead of that,” and wish I had more time to revisit the chapters, but my publisher tells me that the worst part about this book is that it’s too short. Well, I did a pretty good job of interviewing myself, but to my credit, I’m easy to talk to, especially to myself. Here’s what I learned about myself as I conducted this interview: that I rarely actually answer an interview question because I’m so tangential. Now it makes sense why Lino changes the subject on me so often. I guess that’s why he gets the big bucks. To get a copy of Would You Date You?, click here. And please send me your feedback, positive or negative.